Can a sub-$50 make the cut? The answer after three nights of testing is yes, definitely. 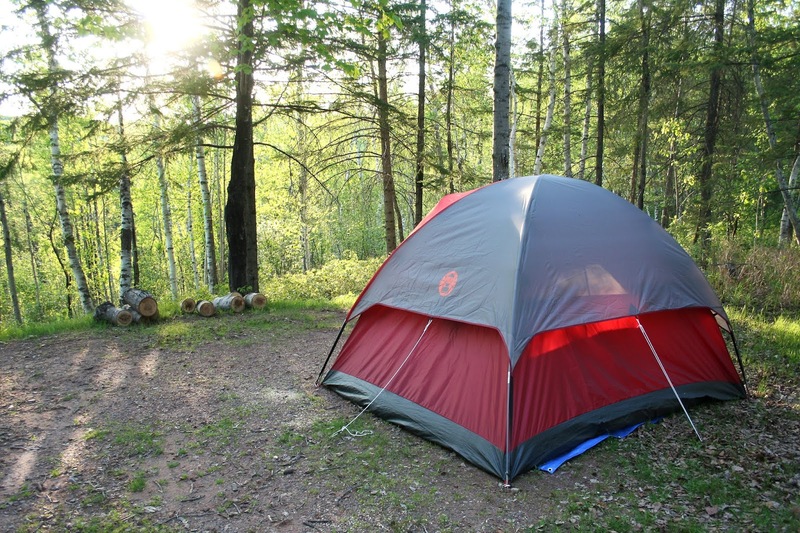 For years I've relied on my beloved Eureka Taron2 backpacking tent for all of my camping overnights, whether it be simple car camping at a state park or a backcountry trek in a national forest. 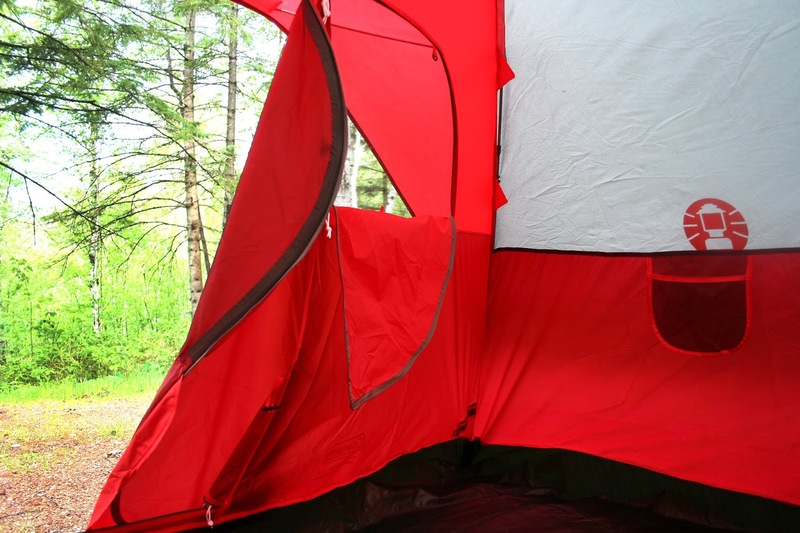 The tent is fantastic, durable, and completely perfectly suited for backpacking needs. But when it comes to traditional camping out the back of your car? The Eureka belongs elsewhere, which is why I picked up a new tent specifically for car camping. I've had my backpacking tent for about four years now, and pitched it in Utah's deserts, pinewood forests of Wisconsin, and snowy peaks in Colorado. It's held up multiple fights against ferociously strong winds, torrential and terrifying thunderstorms that have barrel-rolled into Badlands National Park, and in scorching hot sunlit heat. Since I do my fair share of both backpacking and car camping, I realized it was time to get another tent and eliminate the risk of extra wear and tear on my Taron2 from car camping, and off to Target I went. Big-box stores like Target, sell excellent car camping gear without breaking your wallet. 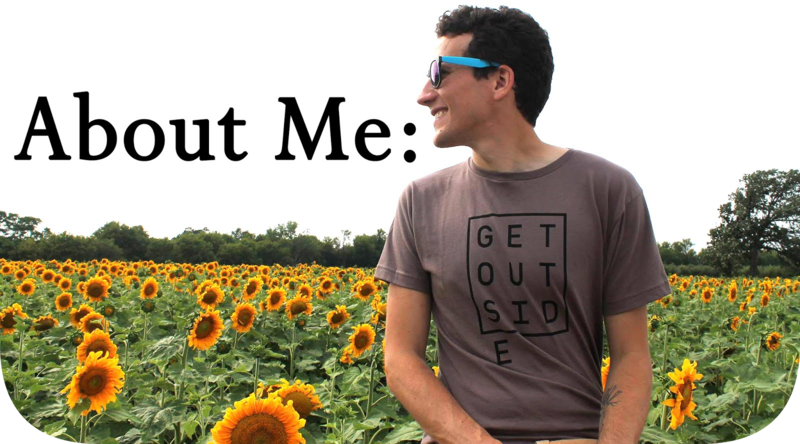 I particularly like this approach for acquiring gear because I've always believed that the outdoors should be affordable to all, and most outdoor gear can be rather pricey. Coleman makes a great, easy to set up. 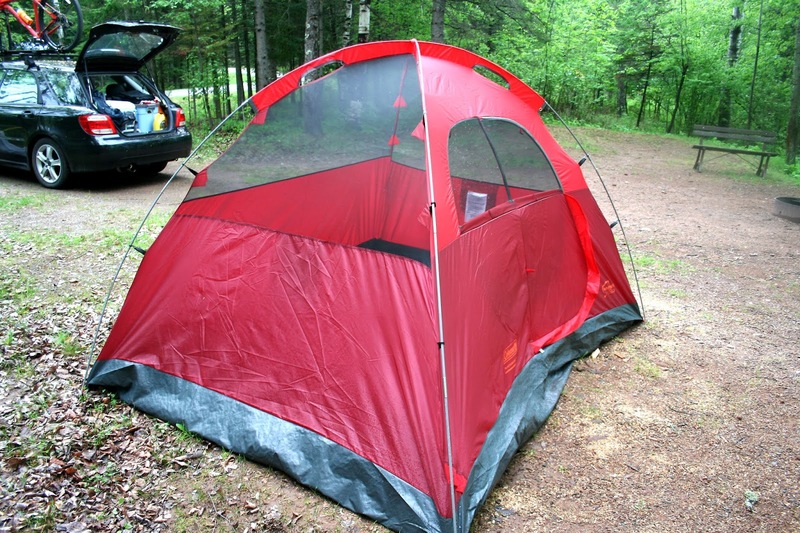 and affordable dome tent (along with a hodgepodge of other outdoor gear like this) for weekend outings to campgrounds. I didn't want to drop a ton of money on a car camping tent, so I bought Coleman's Flatwoods II for $49.99. Bang for your buck? Read on. The Flatwoods II sleeps four, comes with a rain fly and is best suited for late spring, summer ,and early fall campground camping. It's spacious inside and while four abreast sleeping might be a tight squeeze, it could be done, though it'll house three adults and gear just fine. With 9 x7ft dimensions and a nearly 6ft ceiling, I being 6'2, had zero problem moving around inside. 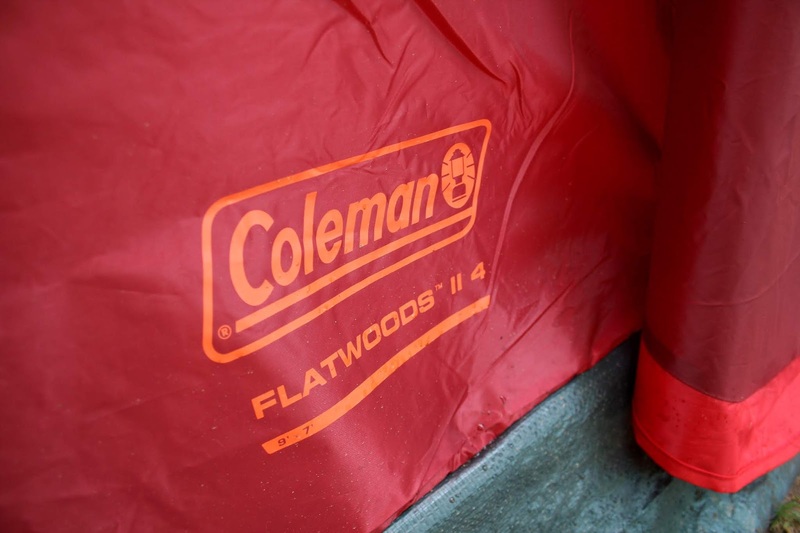 There's only one door on the Flatwoods II, and since the tent employs Coleman's "Bathtub" floor, the step in and out, is a bit high and tricky at times. That "Bathub" floor however, keeps you dry and eliminates any water trickling in at ground level, as the gray, tough polyurethane floor curls up nearly a foot on all four sides. Nicely done, Coleman. Inside, there are two gear compartments on either end of the tent and on the front wall (door area) are two zippable screened windows, which was fun to unzip and see the sunset fall on the trees at Amnicon Falls State Park. 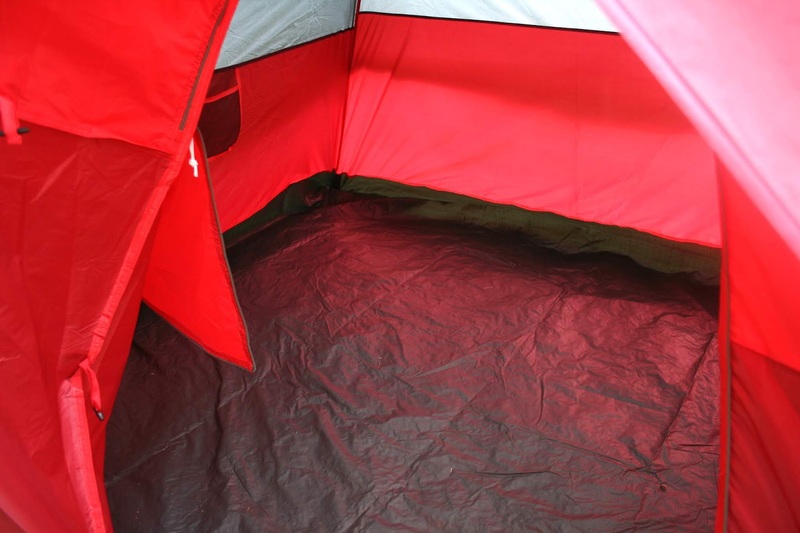 Above, there's a loop to hang a light and in one corner near the front wall, there's even a zippable tiny pocket designed for threading an extension power cord into the tent should you need to inflate a queen size air mattress which would fit with ease. Set-up takes about ten minutes and is fairly straight forward. The tent bag, has instructions sewn into the inner cover and there's a separate pouch containing all the thin metal stakes, poles, and guy wires. The rainfly was a bit tricky to attach and there's a small pole that creates a small awning above the doorway. Take-down is again, easy, but when it comes to fitting everything into the tent case, that's the biggest let down. No matter how tightly you roll up the tent, its fly and jam its other mounting essentials in, the tent bag struggles to close. I remember this being an issue too on an older Coleman tent I had years ago. Coleman needs to include a larger tent bag with a cinch on top, that will fit everything quick and easy. The $50 price tag comes with a few drawbacks however. The stakes while metal, aren't as rigid as you'd hope (I plan to pick up a more heavy-duty set of tent stakes from REI), the rainfly's plastic clips that join the main tent's four corner rings are bound to break over time, and its poles are almost too pliable. I might attempt to find similar sized metal poles to fix this. The tent material itself? Solid, solid, and more solid. I don't fear any rips or tears happening. Four days of camping and exploring three amazing Wisconsin state park properties allowed me to fully test out the Flatwoods II, at Amnicon Falls State park where I chose to call home for the long holiday weekend. Sleeping in the tent, there was plenty of ventilation and on my last night, it thunderstormed. Heavy rain had little to no affect on the Flatwoods II and I was kept perfectly dry. I like in particular how there's a cuff that runs along the door zipper, to keep rain out. Coleman boasts on the package that their tent is "Great for backpacking," and I'm a tad skeptical on that claim. 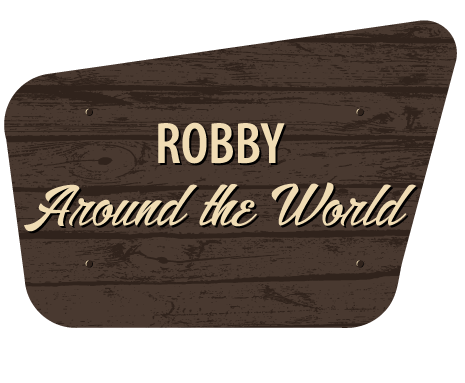 Car camping in a traditional campground? Yes it's great for that but I'm not sold on its durability in a true backcountry setting, especially if inclement weather hit. It's 8.82 pound pack weight is actually comparable compared to the real, serious, four-person backpacking tents from brands like MSR's Elixir 4 (~9 lbs), Marmot's Tungsten 4P (~8 lbs), the Kelty Salida 4 (~7lbs) , that cost hundreds of dollars more. You could perhaps try backpacking with the Flatwoods II, but get yourself a different stuff sack or tent bag, and some upgraded stakes. So, $50 well spent? 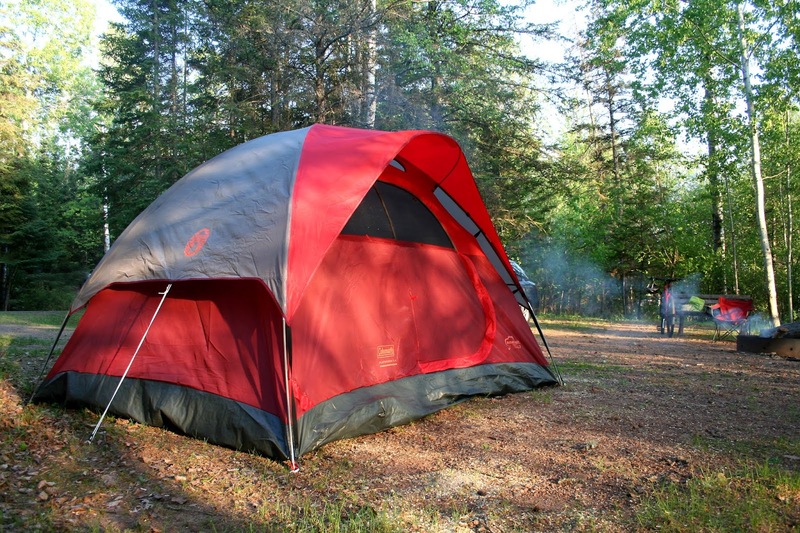 Yes, for your weekend adventures to state and national parks where you'll be pitching a tent in a campground, the Flatwoods II is worth a look. I strongly recommend it as a simple, cheap, and reliable option for car camping. I plan to use mine as long as I can, plus, with typical post-trip care (cleaning, airing it out, properly folding it, etc. ), I'm confident I'll be able to effortlessly get more than a dozen or so Friday through Sunday trips out of it. UPDATE 9/1/2018: we took the Flatwoods II to Buffalo Gap National Grassland, where it fought battles all night with 30,40 and at times 50mph wind gusts. The tent held its rigidity for the most part but was partially ripped due to the ferocious winds. It was a bit nerve wracking, and the next time I camp in an environment that's that windy I will be bringing my backpacking tent that I know will stand up to it.